“Finding Ariadne” by Doris Kenney Marcotte is a mesmerizing tale set in 1465 BC on the mythical island of Kaphtor. Ariadne is the daughter of the Minoan Queen Pasiphae. In this version, the peaceful, matriarchal Queen Pasiphae has no love for her daughter, especially after the loss of two beloved sons. She goes into a mental decline when her most favorite son dies, blaming the Athenian king for his death. To get punishment and revenge, Queen Pasiphae orders that the Athenians send fourteen children to be sacrificed every nine years. Ariadne abhors her mother’s vengeance, and believes it goes against everything the Kephti people believe in. To stop these children from being sacrificed in a labyrinth by the Minotaur, Ariadne teams up with Athenian Prince Theseus, a man with whom she has fallen deeply in love. Their path is a very difficult one and they have much to overcome to defeat the people who stand against them. I love Greek Mythology. What made “Finding Ariadne” really stand out is that the author did a clever job of weaving a mix of Greek tales into one story. In this particular tale, she includes the story of the Minotaur, Icarus and Daedalus, just to name a few. This tragedy was brought to life by the vivid scenery and creative dialogue added by Marcotte. I could not put this book down! I started reading during the daylight hours, and when my husband came home from work, he found me sitting in the dark still reading with a reading light. He noted that I had not appeared to move. What made it even worse, was that when I finally finished the last few pages, I felt bereft at having to say goodbye to this couple! 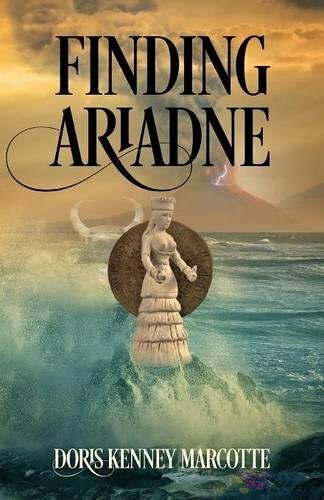 “Finding Ariadne” by Doris Kenney Marcotte is a must-read for fans of Greek Mythology. I highly recommend this as a selection for a reader’s group as well as it will stimulate lively discussion. Readers will also enjoy seeing these stories told from a matriarchal perspective. This story awakened my interest in Greek Mythology. After I finished reading I explored the legends of the Greek characters mentioned in these pages. I am looking forward to reading more books by Doris Kenney Marcotte!